Today, a large proportion of dogs live indoors, their lives interwoven with their family’s lifestyles. We humans live harmoniously together with our dogs under one roof. There is no such a thing as architecture for dogs; dogs live in people's architecture, and according to the owners' choices. Challenged to design architecture for dogs, we decided to give the animal a space of its own. The assignment was taken literally and approached in a very traditional manner by updating the classical dog house design. Even Snoopy, the world’s most famous Beagle, lived in a house quite similar. 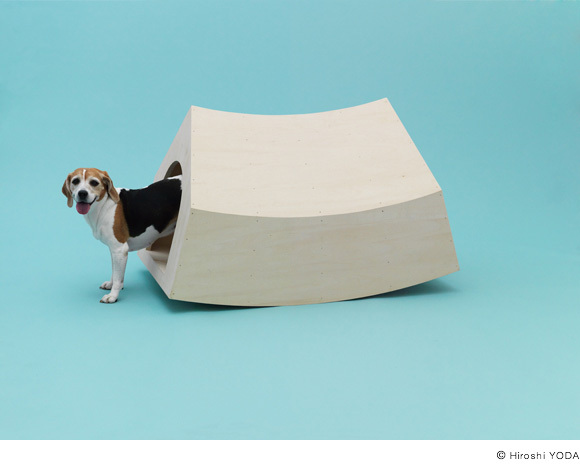 Starting with the archetypical shape, the simple and symbolic form of the Dog House, which also refers to the prototypical human shelter, needs very little transformation to start giving a message. Through this modest metamorphosis, the house has becomes an elegant and playful object, creating both a hideaway and interactive toy. Beagles are known to be intelligent and good natured dogs that play well with children, so our design strives to create a challenging and playful environment that beagles would enjoy. The curved shape invites the dog to enter the house, stimulates play and offers a comfortable and quiet space. Every time the dog enters or exits, the house answers with a subtle motion. The rounded bottom touches the ground gently with little friction. The rope attached to the house makes it easy to move for both dog and owner, and humans can easily carry its wedge shape. The interaction with humans is made more obvious since the curved lines reach human eye level. The firm and active Beagle has inspired us to design a simple, strong and playful object." Jacob van Rijs and Nathalie de Vries. 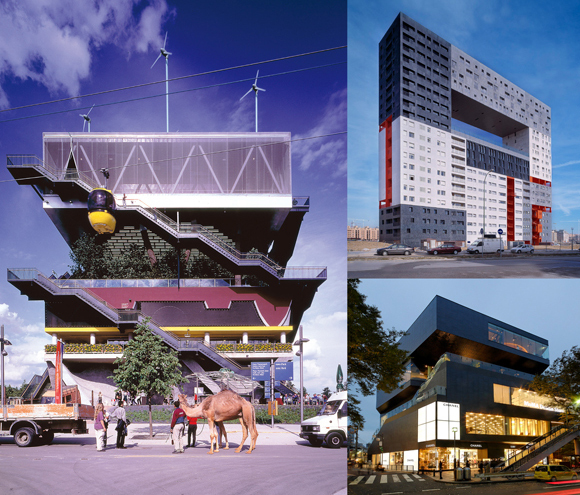 In close collaboration, the three principal architect directors produce designs and studies in the fields of architecture, urbanism and landscape design.